Bill Finkbeiner with son, Christian. Bill Finkbeiner is poised to do what no one else has ever achieved. 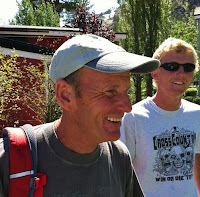 He has run every Leadville 100 since 1984. 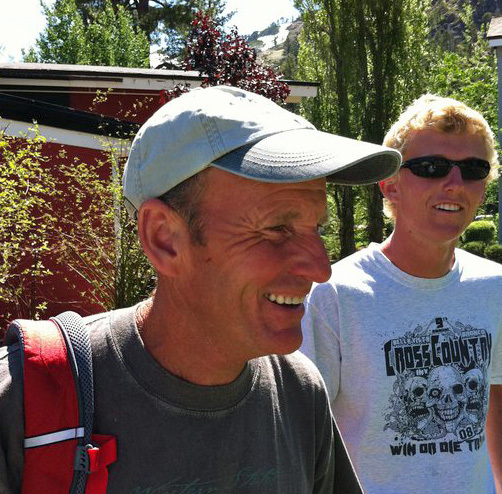 On August 17, 2013 Finkbeiner will be running this 100 mile footrace for his thirtieth straight year. The Leadville Trail 100 is a high altitude trail race that began in 1983. The race begins and ends in Leadville, Colorado at an altitude of 10,200 feet. Elevations range from the low point of 9,200 feet to the top of Hope Pass at 12,600 feet. They call Leadville the “Race Across The Sky”, the race with altitude and attitude. Finkbeiner has an amazing running streak (continuous days without missing a day of running). In fact, he has run every day since January 1,1980. You heard correctly; he hasn’t missed a day of running in 33-plus years. In sickness and in health, good weather or bad, he runs. When Finkbeiner began running the Leadville 100 in the 80’s, he was a frequent top ten runner at Leadville and the Western States 100. He never had to worry about cut-off times. These days, he “feels pressure” with cut-off times and worries that he might not finish within the 30 hour time limit. He knows the race would be easier if he had time to increase his weekly mileage and properly acclimatize to Leadville's elevation. “1996 was the last year I trained properly”. I asked Finkbeiner what it was that drove him to keep coming back to Leadville year after year. He said he loves to train in the high country and enjoys the unique difficulty that altitude presents during the race. Initially, there was a rivalry he enjoyed between Colorado and California runners. He also knew a runner named Arthur Schwartz, who had run all of the Leadville 100’s, inspiring Finkbeiner do the same. Finkbeiner made it a personal challenge to “outlast” Schwartz. Finkbeiner is now in the lead of course, having outlasted all rivals. Will you quit at number 30? “It’s probably smart to quit, but I’ll probably do more. I have no exit strategy. If I do continue to 31, then I’ll have to stay and do 35. I just like round numbers”. 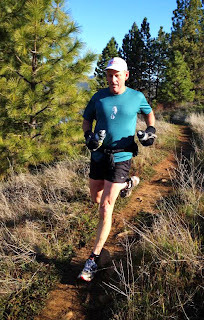 Finkbeiner has raced Western States 17 times, but he reminds me that he has completed the event 3 other times unofficially; once as a pacer for a deaf runner, one time with 10 runners after the Tevis Cup, and during the 04 winter crossing with Dean Karnazes and Tim Tweitmeyer. 17 official finishes and 3 unofficial gives Finkbeiner the round number of 20 that he's comfortable with. Finkbeiner has an uncanny memory for dates, times, and places. He knows practically every rock, mile point, aid station, and finish time for every race he’s entered. His ability to recite the mathematical constant of Pi out to 100 decimal places has always dazzled his friends. Finkbeiner has a bunch of friends. He would give you the shirt off his back if you needed it. I didn’t ask, but there are probably a nice round number of people that are Finkbeiner shirt recipients. For this year's running of the Leadville Trail 100, Finkbeiner said; “This is a benchmark. I can quit here”. In nearly the same breath he said, “Naw, I have to go to 35".